The neighbouring Tesla at the Star Casino's supercharger station. It was the week I was reviewing a Tesla. I had driven to the Star Casino in Sydney for a recharge when a neighbouring driver, Tim Brian, came over and greeted me. “That’s Heath’s Tesla”, he said. He was right. The Tesla was on loan from Heath; but how did he recognise a car that spends its time in Melbourne? The days that followed were revelatory of the enthusiasm held by Tesla owners. They mingle on official Tesla forums, commune at charging stations and catalogue the license plates of Teslas spotted in the wild. Ask a Tesla owner how many licence plates have been catalogued and they won’t give a straight answer. This information is reserved for those who pay the admission price of a Model S.
Various stakeholders interviewed claim there is anywhere between 220 to 300 Teslas roaming the streets of Australia. Tesla won’t confirm sales figures; although anyone who places an order will have to wait months before they can take delivery. Diehard owners keep in touch throughout the day by way of an invite-only WhatsApp group. Roughly 40 owners discuss matters as important as the environment, to those that are less serious, such as “what your car colour says about you”. Tim Brian ordered his Sequoia Green Tesla in August of 2014 and took delivery in February of 2015. 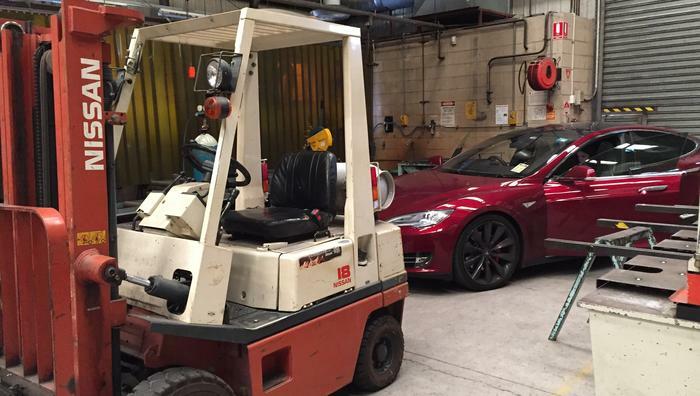 “After I ordered it, [Tesla] stopped producing the greens. There’s only two or three in Australia,” he said during an interview. An unfortunate mishap delayed his delivery by three days and put the company’s customer service to the test. “They had to change transport providers in between Botany Bay and the showroom [due to a strike]. Because of the last minute change, the people they got damaged a few of them. 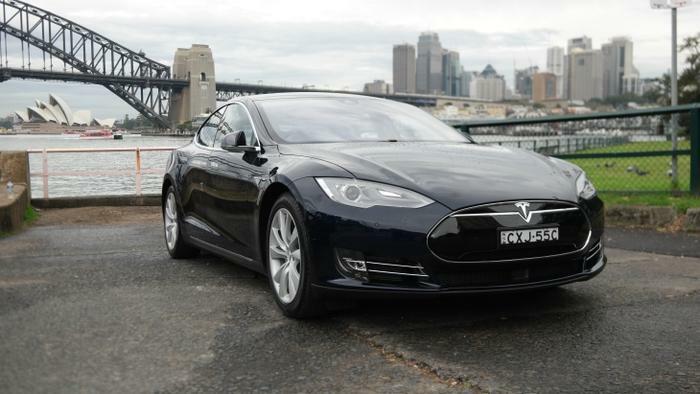 The Model S is an important car because it has a 270kW electric motor and a theoretical range of 500kms. 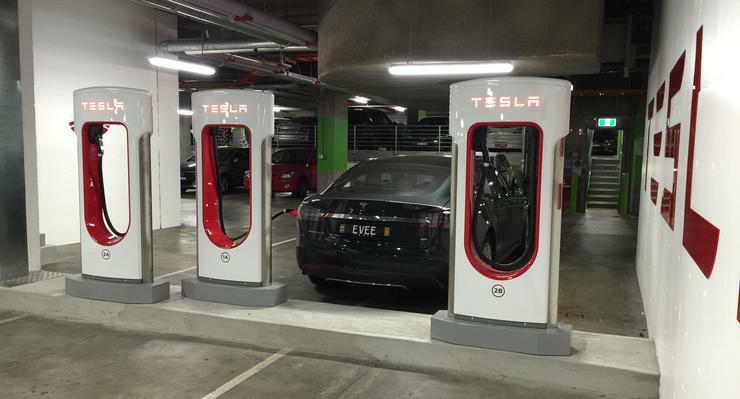 Charging infrastructure is progressively rolling out in Australia. Presently most owners charge their cars at home overnight. Brian has never faced the prospect of running out of charge. His wife, however, is another study. “My wife will take it to the limit. She has been driving around on 1 per cent. Early adopters admit buying an electric car does come with growing pains. 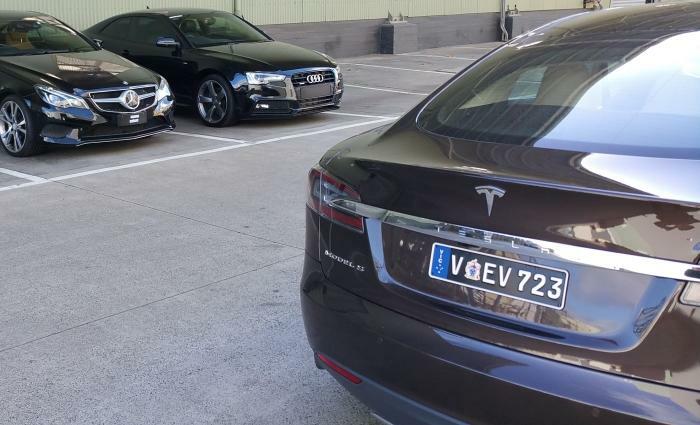 Tesla owner Tim Washington, Model S 85 in Brown, is the man who started the WhatsApp group. ”All the new owners are trying to figure out the best way to drive, where to charge and the best way of doing things. Without the group, all of this information would be lost. “You’re not going to get the same involvement from owners [of other cars]. We all feel it’s our responsibility to push electric vehicles,” he said in an interview. Washington is also the founder of Jet Charge, Tesla’s preferred partner for the installation of electric car charging infrastructure in Victoria. The batteries used in consumer electronic devices deplete in capacity over time. Tesla road cars are not exempt from this obstacle. “Battery life will deplete over the lifetime of the car. And it’s not like the car won’t work, it will just hold less charge,” said Washington. The batteries are covered by an eight year warranty. Replacing the batteries today could cost anywhere between $15,000 to $25,000, various owners estimate, though the cost is expected to drop significantly by the time the eight year warranty expires. “By 2020, battery prices should drop to 75 per cent of what they are now,” Washington estimates. Ongoing support from Tesla appears to be one of the company’s hallmarks. 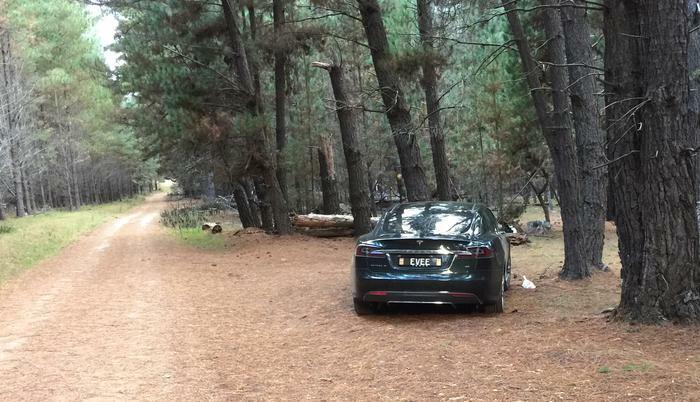 Each Model S is connected to the Internet with the integration of a 4G Telstra SIM card. At night, when the car is parked and charging, it can be set up to have its software upgraded and new features installed. Mathew Peterson is among the first wave of people in Australia to take delivery of a Model S. Peterson placed an order from an iPad in his bed three years ago, for a P85+ in Signature Red, well before company representatives were hosting test drives from lavish Hotels. 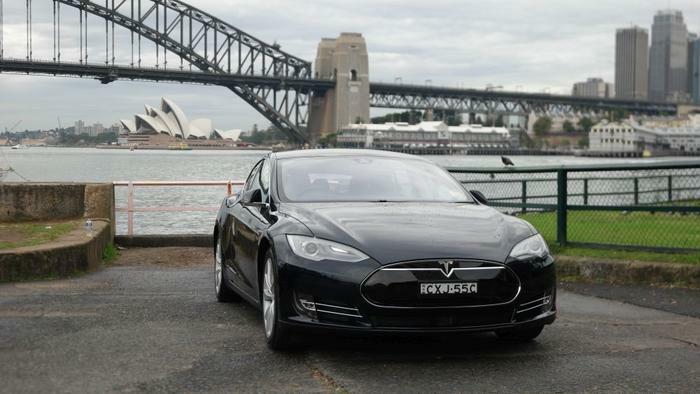 “It was the second Tesla in Sydney to be delivered,” said Peterson. “My wife and I have owned it for seven months and it’s aging like a fine wine because we’re getting new updates. Interstate road trips may require a brief hiatus so that the car can be recharged. Peterson has an arsenal of four total chargers; a combination of both official Tesla chargers and aftermarket options. “When we drove to Melbourne, we had to stop twice. We charged overnight in Canberra and again at a welding base. Offsetting the ‘to the wire’ road trips is the financial reprieve from not having to pay for petrol. The savings were substantial enough to have Peterson's wife purchase a second Tesla, Model S 85 in Pearl White, for use as a hire car in her new venture, Evoke. A month ago two supercharger stations were available in Sydney; however, Tesla has rolled out 10 additional charging stations in Sydney, Melbourne and Brisbane. A network of superchargers is currently underway along the east coast of Australia, scheduled to be complete mid-way through 2016. These will be hot spots where owners can charge their cars for free, talk matters pertaining to the environment and do all the sorts of things we never seem to do at petrol stations.